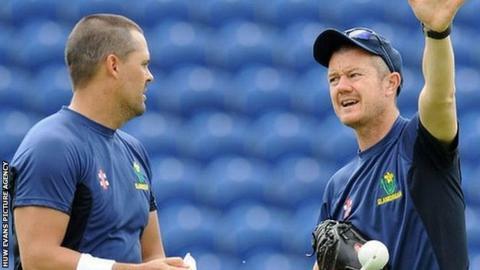 Toby Radford has left his position as head coach of Glamorgan a year before his contract was due to end. Radford joined the Welsh county after leaving his role as batting coach with West Indies in October 2013. Glamorgan finished fourth in Division Two of the County Championship in 2015. "I am pleased the team showed major improvement in the past two seasons. It is disappointing for me not to be able to see the work through to its conclusion," said Radford. Radford's tenure was marked by mixed results with a T20 Finals Day near-miss in 2014, followed by improved Championship results but limited-overs disappointment in 2015. Glamorgan have high-profile figures in Hugh Morris, assistant coach Robert Croft and captain Jacques Rudolph, but with thin resources on the field they have yet to announce the hoped-for bowling recruits for 2016. Glamorgan chief executive Hugh Morris praised Radford, adding: "His hard work and commitment to the role has been evidence for all to see and under his leadership we have made an important step forward". The club have made no comment about a potential replacement, but it is understood that bowling coach Robert Croft will lead pre-season training.